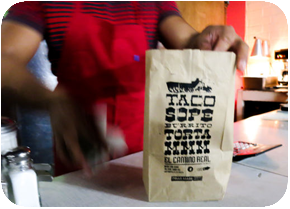 Custom printed to go bags from Gator Paper are perfect for take out bags, restaurant to go bags, long deli sandwiches, printed bags for hardware stores, and more. These custom bags are more than just an ordinary to go bag! 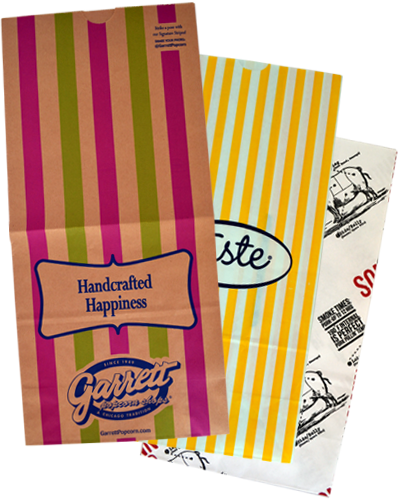 With a wide range of standard sizes from 1# to 25#, and 1/6 barrel grocery bags, Gator Paper offers high-quality, customized bags for food service packaging solutions with low minimums and competitive pricing. From candy shops to fast-food chains and even the hardware store down the street, Gator Paper has you covered. Short run orders of all of our printed paper bags are our specialty! We are your #1 solution for custom printed bags. Custom printed To Go Bags from Gator Paper will leave a positive lasting impression with your customers! How many To Go Bags are in a case? To Go Bags come 1,000 bags per case and have a 5 case minimum order requirement. How long do custom printed To Go Bag orders take? Lead time for custom printed To Go Bags orders is 5-6 weeks. Rush orders are available for an additional fee. What are your printing limitations? Three color spot PMS with registered and full coverage printing capabilities. Adobe Illustrator, .EPS and high resolution PDF files work the best. Bitmap files are never accepted. Vector art files are preferred. If the line artwork is simple enough, sometimes a JPEG file will work. Need a price quote on Custom Printed To Go Bags? Contact us today! Check out our line of custom printed Sandwich Bags! This high quality single service Sandwich Bag is guaranteed to impress!